Colourful and meaningful drawings will be proudly displayed in Frimley Green’s village centre to celebrate all things Easter. Over the last few weeks, children at Frimley C of E Junior School have been hard at work creating pictures for this year’s Easter Artwork Competition. 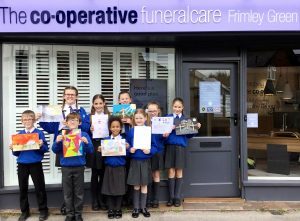 Judged by the school’s head teacher and The Co-operative Funeralcare in Frimley, the winning entries will now be proudly displayed in branch until Easter. Lorraine Paice, Funeral Co-ordinator at the new branch at no.3 Wharf Road, said: “We opened our doors on 7 January and it is great to have got involved in the local community so quickly. “Our branch is part of the regional, independent co-operative – Southern Co-op – so we have a commitment to make a difference in our local areas. The winning artists visited the new branch on Wednesday along with the Vice Chair of the Frimley Business Association Sarah Croke. Lorraine said: “We began with a tour and then lots of questions about my job and funerals, they were all very impressed with the branch and said how bright and cheerful it was and how nice it smelt. They had a great time, very inquisitive and really brightened my day. Southern Co-op’s community engagement programme ‘Love Your Neighbourhood’ addresses four key social themes – promoting greener, healthier, safer, and more inclusive neighbourhoods. To find out more about ‘Love Your Neighbourhood’, click here.